There are times, when someone asks for a recipe, that it’s simply a matter emailing them the document that I’ve saved it in. Or just jotting down what I do from memory. Or making a copy of it, plus a couple of notes covering my personal “tweaks”. Sometimes, though, it’s a recipe that is a conglomerate of three or four recipes, plus a whole lot of tweaks that aren’t written down or easily transcribed. Add in some memory work – what did I do at that step? – and you have a case of ‘easier requested than sent’. This is one of those … it’s a bit involved. 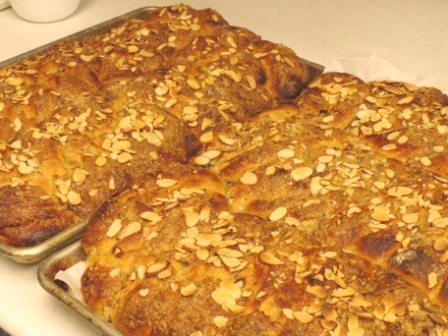 It was inspired by the Challah recipe in Peter Reinhardt’s Artisan Breads Every Day, combined with the periodic surplus of egg yolks I get when Mr. Caffeinated makes angel food cake. Please note that this is a DOUBLE recipe. As in, I’ve already doubled it. 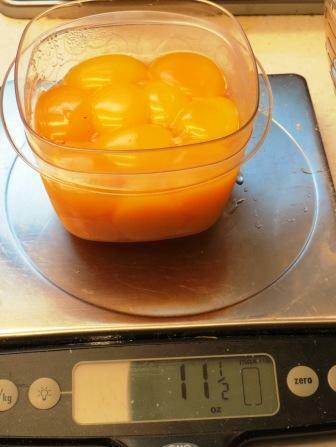 This is because a double batch uses up all the egg yolks from an angel food cake. This means you can halve the recipe and everything should work out just peachy. I bet you can quarter it and it would be fine. I weigh most of my ingredients. Much easier than scraping things out of a zillion measuring cups. I’ve put the equivalent measure in the recipe at the end. 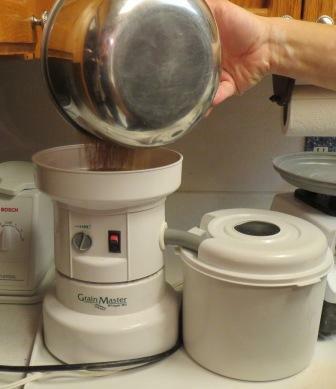 Weigh and mill any whole wheat that you’re planning to use. 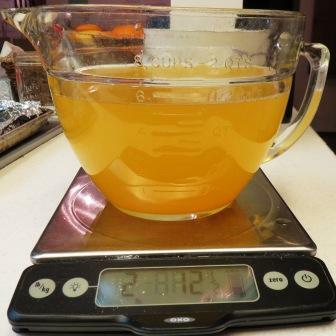 Measure the water, sugar and yeast into a separate bowl and whisk gently together. Add everything else to the mixer bowl. 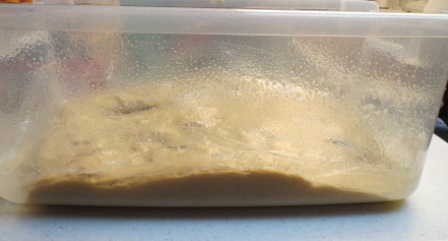 Add yeast mixture (which should be bubbling along), and turn mixer on low for two minutes. Dough will be very wet and sticky. 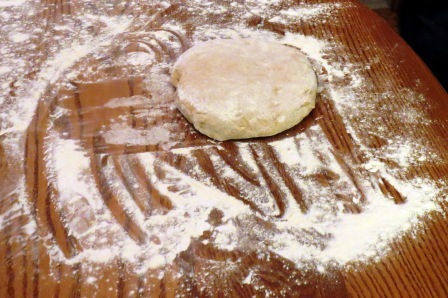 Transfer dough to a well-oiled bowl or bin. The container must be at least double the size of the dough. This stuff will GROW, and if the container isn’t big enough, it will TAKE OVER YOUR FRIDGE AND EAT ALL YOUR CHEESE. Seriously. You can thank me later. Cover well and refrigerate overnight. 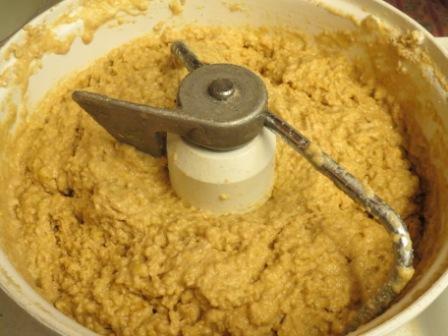 Combine all filling ingredients in a mixer, and beat till well combined. I generally microwave the almond paste for a minute to soften it up before adding everything else. I use vanilla sugar for this recipe, but plain will work just fine. What is vanilla sugar? Well, my version is a byproduct of making vanilla. After the beans have soaked in vodka for several months, and I’ve decanted the extract, I pulverize the beans and sugar in my blender. This gives me flakes of vanilla bean as well as heavily flavored sugar. 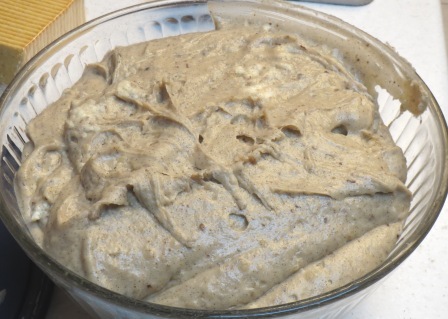 It also means that everything I make with it looks rather brown and flecked, but I figure that’s a small price to pay for the flavor boost. Flour large table/counter well. 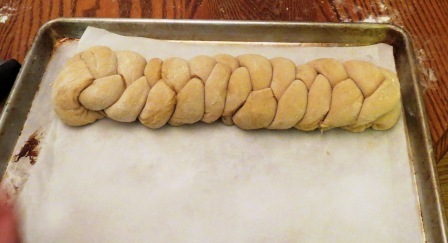 Divide dough in half, and put half on the counter. Roll out into large rectangle, about 1 cm thick. 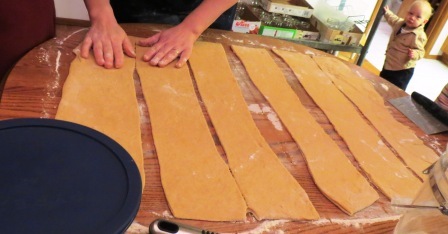 Using bench knife or pizza cutter, cut into 6 strips about 3-4” wide. Put a liberal ribbon of filling down the middle of each strip. 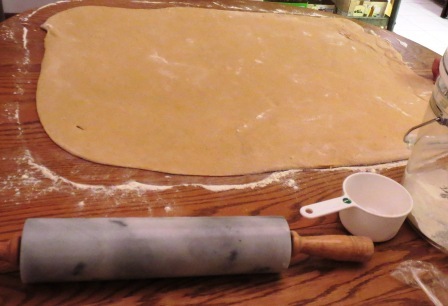 Fold dough over and press to seal filling inside. 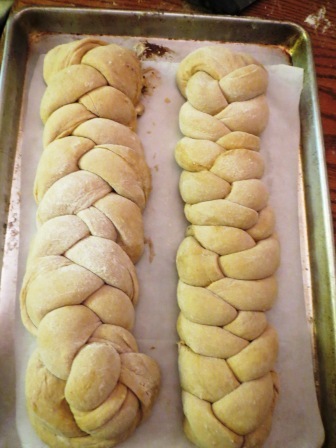 Braid into two loaves, tucking ends under. I always begin the braid in the middle, and braid towards the ends. Brush with egg whites. Sprinkle on vanilla sugar and sliced almonds. Preheat oven to 350°. Bake until interior temperature of loaf has reached 195°-198°. Allow to cool before wrapping in plastic. 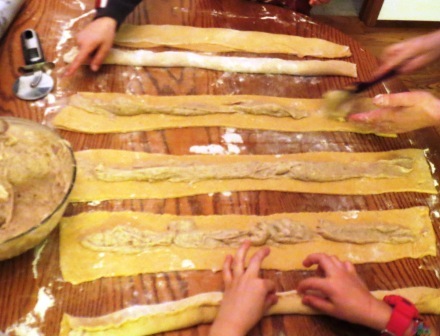 This made five loaves – two long, that stretched the length of the cookie sheet, and three that went on a second sheet sideways. You can use anything as filling for this, or leave it plain. I’ve used cinnamon-sugar, raspberry pie filling and apple pie filling. A savory filling would probably work just as well… I’m thinking of trying ham, cheese and onion sometime. I’ve also rolled this up like cinnamon rolls and sliced it, but it doesn’t leave big pockets of gooey filling like braiding does. It’s a very versatile dough – and a very STICKY one. 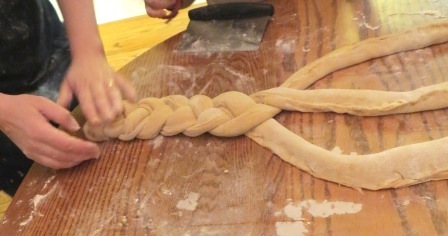 Be sure to have a lot of flour ready for the braiding stage. 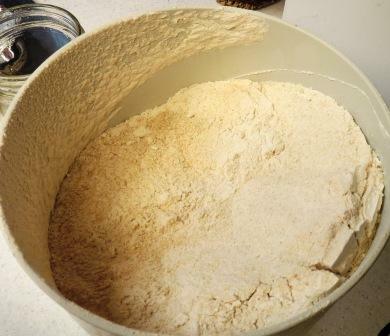 Transfer dough to a well-oiled bowl or bin. The container must be at least double the size of the dough. Spray or brush liberally with more oil. Combine all filling ingredients in a mixer, and beat till well combined. I generally microwave the almond paste for a minute to soften it up before adding everything else. Cover and refrigerate overnight. 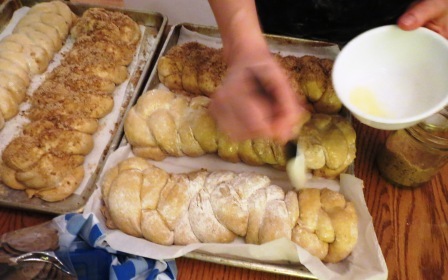 Braid into two loaves, tucking ends under. Sprinkle on vanilla sugar and sliced almonds. Let rise for 30-45 minutes. Preheat oven to 350°. Bake until interior temperature of loaf has reached 195°-198°. 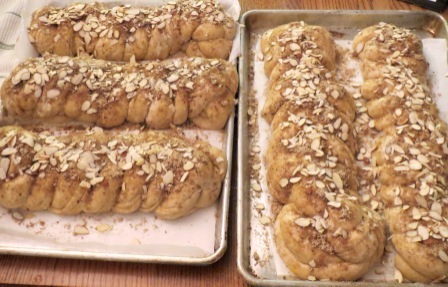 This entry was posted in Baking, Desserts and tagged almond braid, almond bread, bread braid, challah, filled challah. Bookmark the permalink. Thanks for sharing this! Your loaves look beautiful!